Orbital and tentorial surfaces of the frontal and temporal lobes of both of the cerebral hemispheres. Ventral parts of the midbrain, pons, medulla oblongata and cerebellum. Superficial connection of the cranial nerves. Two small spherical bodies referred to as mammillary bodies. A raised area of grey matter being located anterior to the mammillary bodies named tuber cinereum. A narrow stalk which attaches the hypophysis cerebri with the tuber cinereum termed infundibulum. Posterior perforated substance that is a layer of grey matter in the angle between the crus cerebri and is pierced by the central branches of the posterior cerebral arteries. 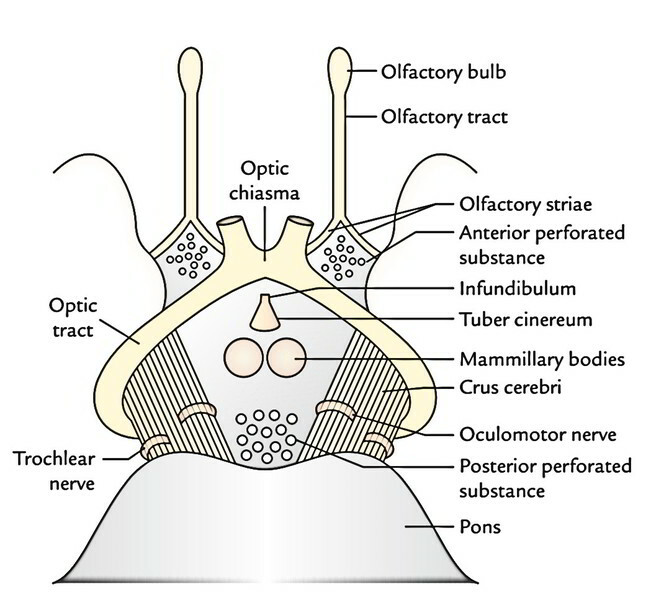 The oculomotor nerve which comes instantly dorsomedial to the corresponding crus. All the 12 pairs of cranial nerves are connected on the ventral aspect of the brain with the exception of the 4th pair (trochlear nerves) that are connected on the dorsal aspect. Every cranial nerve enters or leaves the brain surface at its superficial connection and the fibres which it includes either originate from (efferent or motor fibres) or terminate in (afferentor sensory fibres) motor and sensory nuclei inside the brain, respectively. The very first 2 pairs are connected to the forebrain; the 3rd and 4th to the midbrain; and the rest to the hindbrain. The 11th cranial nerve also gets a root from the upper part of the spinal cord. There are about 20 olfactory nerves on every side. They originate from the olfactory epithelium of nasal cavity and go through the cribriform plate of ethmoid and end in the olfactory bulb which is located on the orbital surface of the frontal lobe. They’re really so fine that no hint is viewed on the olfactory bulb when the brain is eliminated from the cranial cavity. This is a thick cylindrical nerve which appears from the retina and joins the anterolateral angle of the optic chiasma. It comes from the groove on the medial aspect of the cerebral peduncle in the posterior part of the interpeduncular fossa. It’s a slight nerve which comes on the dorsal aspect of the midbrain, lateral to the median plane. It winds round the lateral aspect of the midbrain toward the interpeduncular fossa, instantly above the pons. It’s the largest of the cranial nerves and connected to the junction of the pons and middle cerebellar peduncle by 2 roots: a large lateral sensory root and a small medial motor root. It appears at the inferior border of the pons, opposite to the upper end of the medullary pyramid. It appears at the inferior border of pons lateral to the abducent nerve by 2 roots: a thick medial motor root and a thin lateral sensory root named nervus intermedius. It includes 2 nerves: vestibular and cochlear, which connect in the cerebello-pontine angle. The cochlear nerve is located posterior to the inferior cerebellar peduncle and vestibular anterior to it. It appears by a number of rootlets from a groove between the olive and inferior cerebellar peduncle. It also appears by a number of rootlets from a groove between the olive and inferior cerebellar peduncle below the rootlets of the glossopharyngeal nerve. Its 2 roots: cranial and spinal. The cranial root appears by a number of rootlets from the medulla below the rootlets of the vagus nerve and it’s joined by the spinal root, which emerges by a number of rootlets from the upper 5 cervical spinal sections. It appears by a row of rootlets from a groove between the pyramid and olive.